The first global anonymous compensation survey for Health Economics, Pricing and Market Access professional conducted by Ulf Staginnus, author of healtheconomicsblog.com in collaboration with HealthEconomics.Com has been completed. A wealth of data from various countries and parts of the world has been obtained via an online questionnaire powered by surveymonkey.com. I therefore would like to sincerely thank everyone who has participated and recommend the survey to friends and colleagues! I am very delighted to have reached a decent sample size with a total of 212 responses, but I hope we can increase this next time and get an even more precise picture. 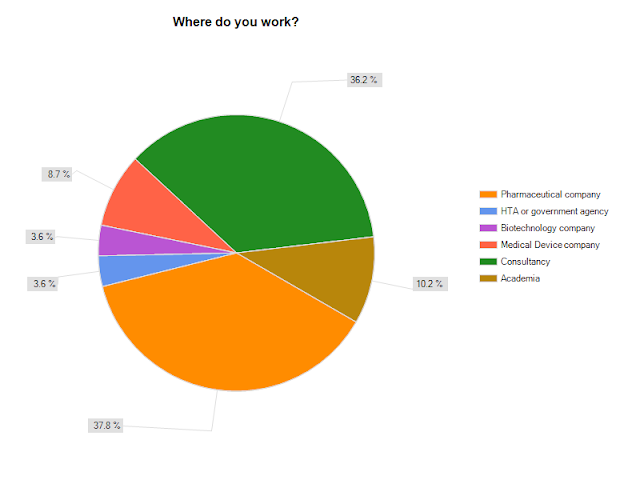 Below pie chart depicts the distribution among the various occupations. 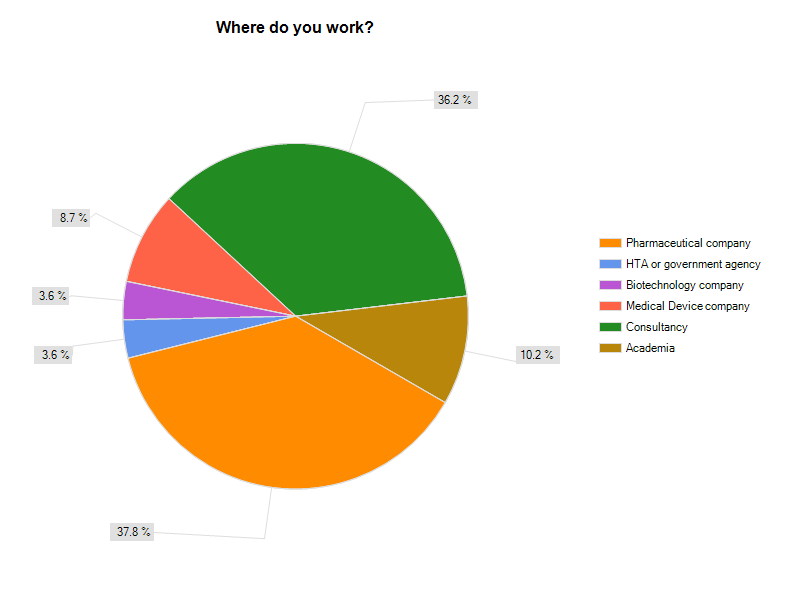 The most common place of employment was in a Pharmaceutical Company or a Consultancy, each representing slightly more than one-third of the population. About 10% percent of respondents were from Academia, almost 9% in Medical Device companies and an even split of 3,6% between Biotechnology and HTA/ Governmental agencies. 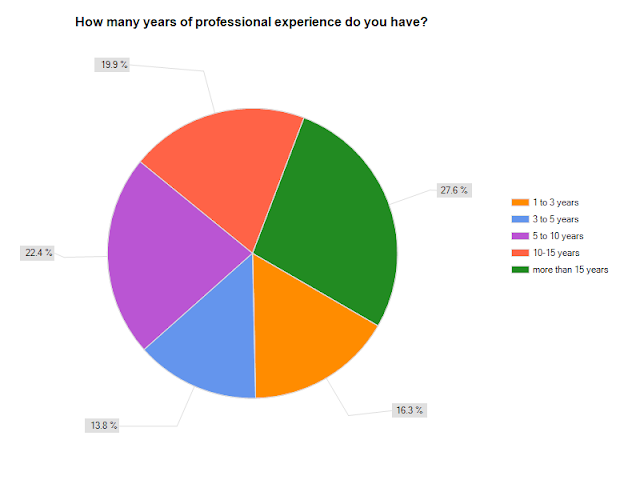 In terms of years of professional experience, most participants had 5-10 (22,4%) or > 15 years of professional experience (27,6%). However, the sample population was limited by a low proportion of responses from individuals at very senior levels (e.g., Executive Director, Vice-President). In addition, there was a lower proportion of respondents with <3 or 3-5 years of experience. Australia, Belgium, Brazil, Canada, China, Denmark, France, Germany, India, Iran, Israel, Italy, Kenya, Lithuania, Luxembourg, Mexico, Netherlands, Pakistan, Poland, Portugal, Romania, Russia, Singapore, South Africa, Spain, Sweden, Switzerland, Turkey, UK and the USA. Considering the entire international sample, the mean annual salary was US$127.000 and €88.838 respectively, with a median of US$125.000 (€86.895). The lowest salary in the overall sample was US$5.178 (€3.600), a professional from Iran, while the maximum was at US$329.749 (€229.257), a Dir from a Consultancy in the UK. The standard deviations were calculated at US$64.975 and €45.171 respectively. The US dollar numbers for the entire sample have to be interpreted with caution due to the weak US dollar affecting the exchange rates when converting into € (figures from August 23rd 20011 were applied; www.oanda.com). The mean salary in the US sample was US$145.760 with a minimum of US$19.000 for a Graduate Research Assistant in academia and a maximum annual salary of $US250.000 for a Chief Operating Officer of a consulting company. The highest salaries are paid in Switzerland, Denmark, Germany and the US. On the bottom of the pay scale ranges were the countries of Spain, Italy and those within the Emerging markets (e.g. Brazil, China) as well as the central Eastern European markets. Salaries can be considered representative across position level, as there was a relatively even distribution among the various seniority groups collected during the survey. As previously mentioned, we are probably missing more data from the very senior levels (e.g. Executive Director and VPs) due to an under-represented sample, as well as from the very junior entry level positions. The survey indicates that the ranges for very senior level executives can be expected to start at approximately US$250.000 in the US, Swiss Franc 300.000 in Switzerland, and €200.000 in Germany for example. As outlined above, there were only a few responses from individuals working in HTA agencies and insurance companies, but a relatively reasonable sample (n=20) from academia, mostly from the US. Academia and HTA agency salaries were generally lower than the salary of those employed in the industry, although one has to bear in mind that many have additional income through consulting projects. Regarding additional benefits, 73% of respondents had positions which conferred health care benefits. While this is a relatively high percentage, it could have been expected to be somewhat higher. Most (70%) survey respondents are covered with either accidental and/or life insurance by their employers. About a third of respondents have the corporate benefit of a company car. This appears to be most common in Europe due special taxation advantages for employers. More than one-half of the respondents have a private pension plan with their company. Tuition reimbursement or school fees covered by the company represented a small percentage of total benefits and this typically represents a higher proportion for expatriates or for those relocating to positions at corporate headquarters (e.g. mainly when relocating to headquarters in Switzerland, Belgium and the UK). Other benefits reported by respondents include meal vouchers (especially in Europe), reimbursement for home internet, and the provision of smart phones or other types of IT equipment (e.g. iPads). It is also interesting to see that more and more companies come around the concept of flexibility on location and allow time from work at home, support home offices and flex time as well as offer specific commuting solutions. This I think becomes even more important for very experienced and senior people in order to attract and retain this talent. More than one-half (65%) of respondents in the overall sample received a bonus, in addition to their base salary. The data is however more dispersed. Bonuses tend to range from 10% to 20% of the annual gross salary, and this varies substantially with company total sales volume and individual performance. More senior executives stated typical bonus ranges of 25% to 30% of gross salary, while junior positions most typically either had no bonus, or a maximum of 10% to 15% of gross salary. Bonuses for senior professionals in consultancy tend to be somewhat higher. Stock options and restricted share benefits were assessed using an open-ended question, and as a result, the responses were quite varied. However, a broad trend is recognizable. There is a clear distinction on the share option front. In the US, regular and significant restricted shares and stock options are being granted, and form a significant proportion of the overall package; however, this practice is much less common in Europe, suggesting that European based employers need to be more aggressive with this remuneration element in order to remain internationally competitive. • Remuneration of professionals in this field remains attractive. However, in areas where a substantial proportion of graduates and professionals are coming into the market, such as the UK, salary levels in the entry and middle management positions most likely will slightly decrease, or at least stabilize over time. • The challenge is to find experienced personnel with relevant country, negotiation, practical health policy and commercial expertise. Professionals that posses that skill set coupled with the ability speak multiple languages will continue to enjoy premium pay. • Southern European as well as Eastern European countries and Emerging markets are at the lower end of the pay scale. However, with increasing requirements and growth in market size, there will likely be an upward correction on the remuneration side in order to attract and retain experienced professionals. • Although not specifically analyzed in this survey, headquarter positions typically command a higher pay. This may explain the higher salaries in Switzerland and certain other markets that tend toward a centralized corporate structure, as opposed to field-based professionals. • US salaries are generally quite attractive, especially with increasing level of seniority. Main additional benefits in Europe include the company car, while the benefit of private health care coverage plays a more important role in the US. • Additional graphs & details, box plots etc. These analyses can be made available on individual request and are subject to a processing fee to cover data analysis and reporting cost. In addition to that, individuals, human resources departments and recruiters can additionally purchase more detailed data sets. Tiered pricing will be applied with specific discounts for students and HTA and/or governmental agency employees. Please contact me (ustaginnus@hotmail.com) in case of additional data needs. We will get back to you with a specific quote and timing in relation to the data consulting request.